During the third round of the Candidates, I observed a funny conversation on Twitter between two leading Dutch grandmasters Anish Giri and Erwin l’Ami, concerning the game Svidler-Kramnik. Erwin l’Ami in Wijk aan Zee 2013. @erwinlami: 41.Qc8 e4! 42.fxe4 Qe2 43.Rf3 Rxd6 44.Qe8! f6 45.e5! looks killing, but 45…f5! 46.gxf5 Rf6!! saves. 0% chance this will happen though. and Erwin added a little later: Svidler played 41.Qc6 which should transpose after 41…e4 42.fxe4 Qe2 43.Rf3 Rxd6 33.Qe8. 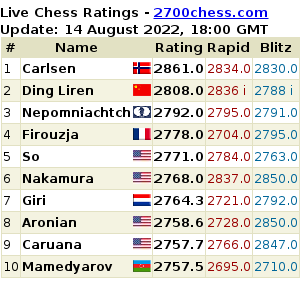 @anishgiri tweeted: I bet you on this one. @erwinlami: Ah, and if you lose the bet you also get board 1! @fabianocaruana: 45…f5 46. gf5 Rf6 is unbelievable… Times like this I wonder what my thoughts would be playing over the board. …and the official website tweeted: @candidatesfide: Seems, we believed in your intuition more than you and retweeted as soon as this variation came out.